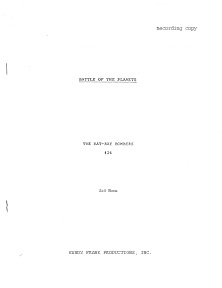 Examples of different Battle of the Planets script types, in this case from episode 26, The Bat-Ray Bombers. 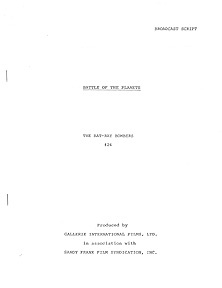 The script on the left is a "Broadcast Script," which includes all the scene descriptions, stage notes, etc. that would be needed by various production personnel. The script on the right is a "Recording Copy" which contained the actors' lines, which were timed out to the second.